You may be able to remove section enrollments within your course Settings in Canvas. Removing an enrollment removes all associated coursework and grades from the course. Section enrollments also include the Test Student, which is created when you enable Student View. If you need to remove the Test Student from the Gradebook, you can remove the Test Student from the enrolled section. Note that the Test Student may be part of more than one section. Sections may be added by your institution's student information system (SIS). 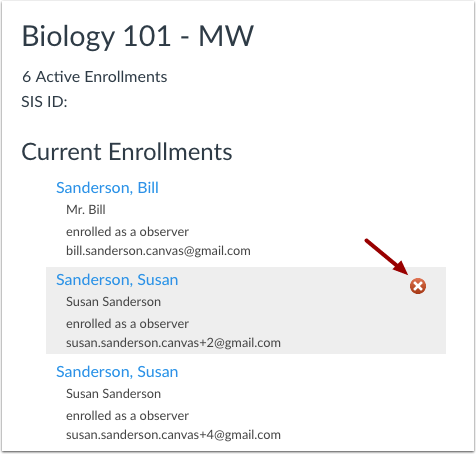 If a section in your course includes an SIS ID, you may not have permission to remove section enrollments. If you want to retain enrollment information for the user, you may be able to conclude the enrollment instead. Hover over the enrollment and click the Delete icon. Previous Topic:How do I view enrollments in a course section? Next Topic:How do I cross-list a section in a course as an instructor? 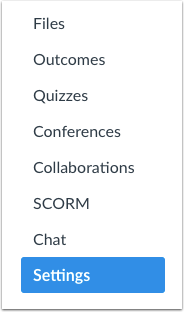 Table of Contents > Courses and Sections > How do I remove an enrollment from a course section?